Is Dead Golden Girl Rue McClanahan Haunting Twitter? Looking at Twitter yesterday, it looked like Rue McClanahan, erstwhile star of The Golden Girls, had just died. People were losing it over the death of saucy southern belle Blanche Devereaux. But McClanahan didn’t die yesterday. She left this earthly existence five years ago. So why the belated outpouring of inaccurately timed mourning? Are people just being big old dumbos? Was there some sort of communication error? 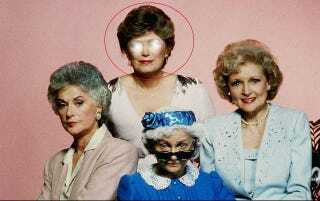 Is dead Golden Girls star Rue McClanahan haunting Twitter? First, the facts: McClanahan actually died June 3, 2010, following a brain hemorrhage. Her death did not initially cause an uproar on social media. Then, last year, shortly after the anniversary of McClanahan’s actual death, people started freaking out about it on Twitter. This year, RIP Rue McClanahan! fever has once again gripped a Twitter beside itself with the (five-year-old) loss of television’s most sexually profligate elder. “Maybe everyone’s Googling ‘Golden State Warriors’ and going to Golden Girls instead?” - a CBS newscaster suggested this yesterday. No. As the Washington Post noted last year, McClanahan’s inaccurate death rumor was probably started by a few influential Twitter users posting bad information, or people not fully reading tweets. This makes the most sense. Rue McClanahan planted the rumor herself; the veil separating life from death is more porous than we had imagined; Rue McClanahan has exerted the force of her eternal soul to regenerate interest in her death on the internet. The outspoken actress and activist is haunting Twitter, using her otherworldly powers to posthumously insert herself back in the national conversation. McClanahan once wrote then-presidential candidate John Kerry a letter informing him that his pheasant hunting resulted in the loss of her political support. John Kerry remains a relevant professional politician....unfinished business?